Okay, spurge still isn’t as annoying as puncture vine. It is getting there, though. I find it nearly everywhere I go. It’s in the gravel. It is in the lawn. It is all over central Arizona. I noticed it in lawns in St. Louis on a recent trip there. Now I just want it to go away. Ain’t happening, though. Weeds are persistent. They could be models for Calvin Coolidge’s advice that persistence is the only requirement for success. The local spurge (Euphorbia sp., Euphorbiaceae) is somewhat interesting. Like other members of the rubber tree family, it makes a polyterpene resin that we call rubber. That’s fun to know, isn’t it? The latex can be a bit of a problem, since it is gooey. Pulling spurge out of the ground guarantees sticky fingers. All kinds of advice from extension services recommend 2,4-D as the best herbicide. In addition, the seeds are teeny tiny – maybe only a millimeter in length. That’s what I read, anyway. I haven’t actually seen any seeds. Apparently, though, I am spreading them around every time I pull a plant out of the ground. That scary thought is doubtful, in my opinion. Like the one that some weed guru said about their roots going down two feet. Bushwah! The plants spread quickly by vegetative means. Yesterday I pulled a bunch of them out of the lawn. Today they are back. Damn! As far as I know, nothing has adapted to flames. A flamethrower did come to mind for how to get rid of the spurge in the lawn. I am not the first person to think of this strategy. 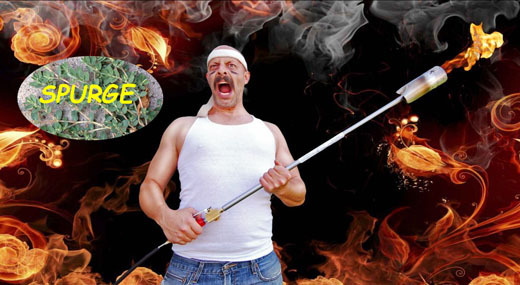 James Gielow’s post here: Fighting Fire with Fire: An Organic Holocaust of Weed Control describes his success-by-flames against spurge. This approach strikes me as a lot like modern cancer treatment – i.e., burn the crap out of it (like radiation therapy) in hopes that the ‘organism’ (lawn) will still survive. Same goes for “chemotherapy” – herbicides. Depending on how much longer it lasts this season – and how much it spreads – I may eventually adopt the strategy that another weed guru suggested. He said to chill out, let it grow, and enjoy it as a free ground cover. Ah, the lazyman’s way out. Now that appeals to me. Haha, you’ll come around to my holocaust method eventually! The true magic isn’t from killing the weed with fire, but destroying the seed! Spurge begins dropping seeds almost immediately. In areas where I can’t use the torch, I treat it like a hazmat situation. Even vacuuming the seeds out if need be. I’ve almost eradicated it from the property! Almost. Almost eradicated? You are my idol, James. Glad I found your post and shared it with all (both?) of my readers. Keep up the good work!